Listening to podcasts. Podcasts are a great way for on-the-goers to work some personal development into their day. You can listen on your commute if you’re driving, taking the bus/train, or even walking. I also like to catch up on podcasts when I’m doing chores like dishes or folding laundry. Listening to a few episodes of “Side Hustle School” makes things feel less tedious. Reading. Probably one of the most difficult personal development mediums for me to follow through with is a book. It’s the easiest one for me to bail out on at the end of the day when I start winding down. Do I really want to read this book that’s going to make me think more after a day of thinking, or should I just watch South Park and completely veg out? 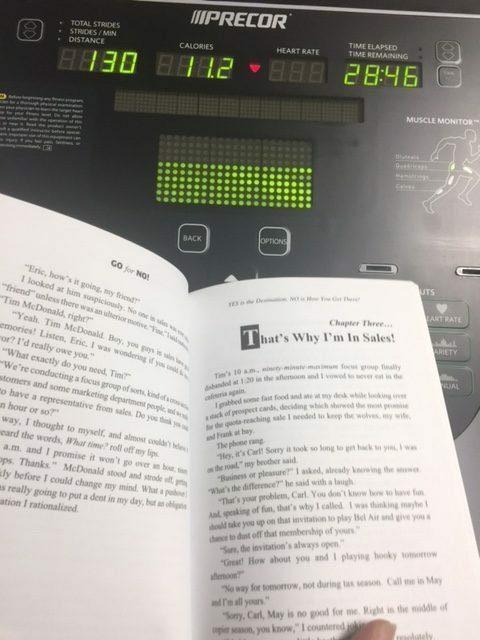 Knowing that this is the easiest way for me to self-sabotage, I started bringing my book to the gym after work and reading on the elliptical. Some days I will set my alarm 15 minutes early and spend that time reading before doing my morning routine. 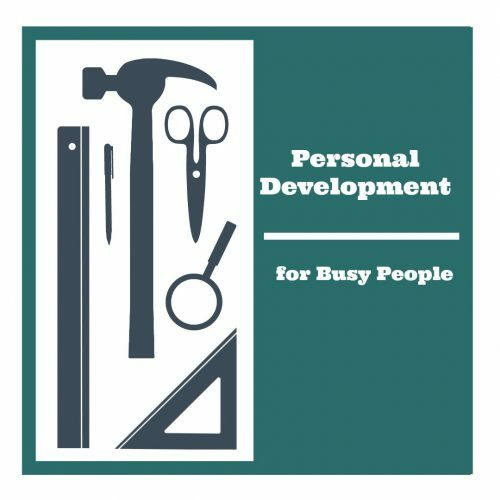 If audio books are your thing, you can also listen to personal development books using the same tips from the podcast section above. Please appreciate that it was very difficult to snap a picture of me reading while also maintaining balance on the elliptical. Online Learning. To me, online learning is anything from signing up for a 30 day course of some sort, following a certain blog/topic, or enrolling in an online class. These all have varying levels of commitment, but regardless you’ll want to have an internet connection and a computer/tablet/phone so you can participate. The next is creating the time to get online solely for personal development reasons (i.e. not Facebook). For an online course, you’ll obviously need more time than reading someone else’s blog posts, which you can do standing in line for groceries or on the bike at the gym. Asking Other People. If you’re at a loss for what podcast to listen to or what book to read next, ask someone you know who is into that sort of thing. All of the podcasts I listen to were recommended to me by someone else. When I was looking into things like personal fitness certification and starting a blog for fun/just because, I asked for recommendations for books to read and started paying more attention to different techniques/plugins used on my favorite bloggers’ websites. No matter how you decide to get your personal development fix, there are a few things you can do to set yourself up for success. Know your weaknesses. For me, that’s the desire to wind down at the end of the day and watch something brainless on t.v. Knowing this, I incorporate personal development time into a workout, while I’m doing chores, or by setting my alarm earlier in the morning. Find something you’re genuinely interested in. If you’re already a busy person, it’s going to be even harder to motivate when you’re dedicating time to something you have “meh” feelings about. Find something that you want to pursue and it’s amazing how much harder you’ll work to make time for it. Make the time. Speaking of making time, one of my favorite time related quotes is “You have just as many hours in the day as Beyonce.” Even if it’s not an ideal amount of time, spending 10 minutes on something every day is better than spending no minutes. You can also think of personal development as a way of shortcutting your learning time because you’re learning from an expert and that will save you time and money in the long run. Be Organized. One of the best tips I’ve heard from Side Hustle School was that if you’re a busy person trying to work a side hustle, organization is key. If you only have half an hour of time set aside to work on a project, have an agenda before you sit down so you can get right to it instead of spending 5-10 of those minutes hemming and hawing about where to start. Making lists at the end of a work day or as you go to bed can be a great way to have ‘what’s next’ ready to go for next time. Make yourself accountable. When you’re busy, it can be easy to just say “Eh, there’s always tomorrow.” The problem is when you keep pushing things to tomorrow you’ll never get them done. Find a way to make yourself accountable for personal development- if it’s a matter of paying for something because that makes you feel accountable, then consider signing up for an online course. If you’re more accountable when it comes to other people, find a friend who also needs some accountability help and make it a weekly check-in. Click here for the blog we wrote about accountability partners if this is going to be part of your lifestyle. More reading when I couldn’t fall back to sleep on Saturday morning. Great way to start the day! 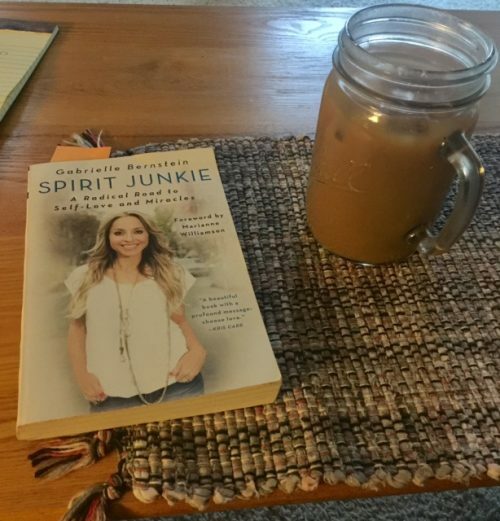 No matter what type of personal development you’re trying to pursue, there is always a way to fit it into your schedule! Try some of the tips mentioned above and find out what motivates you. If you have any tricks for fitting personal development into a busy schedule, or recommendations for books/podcasts/etc, please comment or send us a message! This Tech Thursday, Nicole is solo and talking about podcasts: one of her addictions. How do people make money podcasting? How has podcast popularity changed in the last few years? What are some of Nicole’s favorites? It’s all in this video! Video Killed the Radio Star. And then there were Podcasts. Technologically speaking, I am always a few steps behind the crowd. People who don’t know me assume I’m savvy because of age and job (neither of which are relevant to technological expertise), and people who do know me would never make that assumption. Although podcasts aren’t exactly “technology,” this seemed like a good way to get everyone on the same page and lower their expectations for what I’m about to share. Last week, I finally figured out podcasts. Let me back up a bit. As a kid, I never appreciated my dad’s affinity for talk radio. He spends a lot of time driving, and insists that music is only fun for so long. My annoyance at talk radio (defined by my adolescent self as any radio program with more talking than music) persisted until my freshman year of college. After school breaks, Dad would usually drive me back to Lewiston on a Sunday morning (a 4 hour car ride), and we’d listen to Garrison Keillor. The first time, my iPod was accidentally packed beyond my reach, otherwise headphones would have been lodged in my ears. Now, my opposition to talk radio seems similar to how I viewed “real life” movies when as a young child, not understanding why anyone would be interested in a movie that wasn’t animated (note: I may have actually referred to them as “adult” or “grown-up” movies, which caused some confusion back in the day). 1) Head Games. So, in my rambling introduction, I mentioned the sentimental value of listening to a radio show. Others may get that twinge of nostalgia from listening, too. Plus, certain shows, such as Prairie Home Companion and Serial, require a certain amount of mental energy and imagination. You aren’t being shown all the details, so your creative muscles have to flex a bit. 2) Hands free. Audio is a convenient information delivery system. In other words, you can multi-task. If you’re commuting, at the gym, cleaning your house, washing dishes, doing some data entry, you can just plug in your headphones and go. And yes, while stopping to smell the roses is highly recommended, we do live in a fairly bustley world where the more you can do, the better. 3) It’s free. Most podcasts are free for the listening, which, let’s face it, most of us appreciate. I’m not one to turn down free knowledge…More information on how obtaining podcasts here (in case, like me, you aren’t entirely familiar with how the process works and want more information). 4) The possibilities are endless. There are plenty of different topics and formats as far as shows go. You can even create your own for your business- its a similar idea to our Tech Thursday videos- they don’t directly make us money, but they’re informative and we have fun making them. Call it coincidence, but two days after finishing Serial I saw this article on podcasts and radio broadcasts, which offers the following suggestion:”Rather than listen to the same songs you’ve heard over and over again on your way to or from work, why not keep up with the latest trends of marketing?” (Also, number 5 on the list is Prairie Home Companion, so this seems like a legitimate list). Here’s to listening!